Success … Building Permit has been Granted! For the past week I have had my head down, working on our accounting and driving ahead a bunch of projects that are in need to time and attention. So this blog has been something that I keep thinking about, but couldn’t find the time or the energy to put towards it. While we were busy with our heads down, we received some great news: Our building permit was approved and we are good to start trucking ahead with construction. This sounds great on paper, only we thought the process of getting a permit would take a little longer, so we don’t have all our sub-trades in place and need to refine a few more of our plans. Given this, we hope that construction will begin on April 1st, so that we can be open sometime in very late summer or very early fall. My advice to people who are going through the process of starting a brewery, or any other business for that matter is this: Don’t take your foot off the gas pedal. When you lose focus and when you lose the drive to push things ahead, small delays can have a cascade effect on the process. For example, our dithering on a few specifics around the brewery and tasting room, which didn’t seem like huge delays at the time, effected a bunch of other items. It delayed our architects in making the changes, it delayed our contractor in getting quotes, and it delayed next steps in the process. It ended up that a couple days delay in one decision ended up delaying the process by 2 weeks. Arghh! To be honest, I thought I would feel more happy about getting our building permit, and while this does put a smile on my face it doesn’t make me jump up and down like getting our development permit did. I guess the difference is that we knew we were going to get the building permit, it was just a matter of when. I also think that we just have so much work to do, its hard to take a breath to give each other a high five. Anyhow, we will keep you up to speed on some of the next steps with our brewery in the coming weeks ahead. Lots of activity and hopefully we can drive this project ahead to start operations sooner rather than later. This entry was posted in The Journey and tagged Brewers, British Columbia, Business, Cash Is King, City of Vancouver, craft beer BC, East Vancouver, How to name a brewery, How to Open a Craft Brewery, How to start a Brewery, Starting a brewery, Tasting Room on March 15, 2014 by locuswest. We are set to be part of an amazing community. It is the quality of people in this business that not only encourage new breweries, but also support the current breweries in the market. People like you to be honest. You read blogs about beer, you support craft breweries, you tweet about beer, you talk to all your friends about the amazing beers you’ve had, and you travel near and far to taste different beers. The result of this is to encourage new breweries to open. In fact, I pulled this graphic from the Brewers Association in the USA to show how the number of breweries has skyrocketed over the past 25 years. It makes a person ask the question, how many breweries is the market capable of sustaining? Trying to guess this is like trying to figure out how much higher real estate prices can go in Vancouver. So I grabbed the closest comparison to beer …. wine! It made me wonder how many wineries are there now. 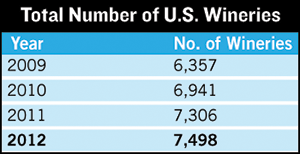 I found this graphic from wines and vines and it shows the number of wineries in the USA over the past few years. As you can see, there are more than 7,500 wineries in the USA, which is about 5,000 more than the total number of breweries. So when I see this, it makes me feel like there is a lot of room in the market for more breweries right?!?! If there are 5,000 more wineries than there are breweries, then there must be room for anther 2,500 to 4,000 breweries??? So what does all this mean to the number of breweries in BC? Well, the most excellent beer writer and blogger Jan Zeschky of the Province Newspaper recently published an article on new Breweries opening in 2014 in this great province. Click here for the full article. He identifies 19 new breweries that are set to open this year, which will surely be a record for British Columbia. We are set to be part of this amazing community, and when I think pragmatically about things, I believe there is a lot of room for all the breweries opening up, and more. So if you dare dream about opening a brewery, or any other business for that matter, do it. Life is too short to put it off any longer. I am living proof (and so is this blog) that your dreams can become reality, so long as you have a plan, you spend the time needed, and you surround yourself with amazing people. Of course, there are a few other details that need to go along with these big picture things, but don’t let them get in the way of following a passion. So bring on the 19 new breweries this year, and I say bring on another 19 next year and 19 more the year after that. Lets fill the marketplace in BC with as wide a variety of breweries as possible. I also hope that these breweries continue to do wild and amazing things with the beer they make. Lets push the boundaries, lets challenge the ordinary and lets realize the potential that is within each and every brewery in this province. This entry was posted in Business Side of Things, The Journey and tagged beer enthusiasts, Business, craft beer BC, East Vancouver, How to Open a Craft Brewery, Starting a brewery, Vancouver on March 2, 2014 by locuswest. When you sit at home thinking of what it would be like to open a craft brewery, you don’t think about stuff like this. If you read my last post on the electrical issues with our space, you would know that our electrical bill went from an anticipated $30,000 for a simple upgrade the transformer on the power pole, to almost $120,000 for a pad mounted transformer. It turns out we can’t put a pad mounted transformer in the parking lot, as our landlord needs to keep these spaces for tenants in our building and other buildings he owns in the area. In fact, he has already received a variance from the City of Vancouver for the number of parking spaces he must to have, and anything that takes away from this number is not permitted. This results in messing this situation up even more, just when I didn’t think it was possible for this process to go off the rails any further. Now instead of a $120,000 bill, which believe it or not we think was actually doable, we are now looking at a substation. Holy crap, I think building an actual Submarine station would cost less than this thing. Initial estimates for a sub station in our building are about $250,000. Unless we can find a economical solution to this problem, there is no question about it, we are done with this space. When you consider that we spent about 8 months on this space, hundreds of hours of time and effort laying out the space, getting quotes, planning equipment, designing tasting room, etc. it seems almost surreal that this is happening. It doesn’t end there. Financially, we spent over $30,000 in fees, permits, lawyers, engineers, accountants, architects and other misc items. When you add all this together, it’s really painful to have reached this conclusion after so much. But at the end of the day, it is better to walk away without $30,000 than it is to walk away with a business that failed to get off the ground. We have our last ditch effort to find a solution on Wednesday of this week. I hope that the people we have relied on so much throughout this process are able to come up with a creative idea that works for everyone involved. One thing is for sure, I won’t be getting much sleep tonight. This entry was posted in Brewhouse and tagged Building, Building Upgrades, Business, Cash Is King, City of Vancouver, craft beer BC, craft brewery, Electrical substation, How to start a Craft Brewery, Im Starting A Craft Brewery, Space, Technology, Transformer, Vancouver on December 3, 2013 by locuswest. Just when you think all is well, and you are about to move onto making things work and realizing your dream, something comes up that threatens to derail all that we have worked for …. for the time being. We have recently discovered that we don’t have enough power to our space. We thought that 400 amps was going to be enough, but it appears that we will need more than this. What does this mean to our ability to lease this space? What does this mean to my dream? The process of leasing a space is filled with many potholes and roadblocks. Finding a space in the right location, with the right layout, at the right price, with a landlord that wants a brewery in their space, for the right amount of term, in a city with limited quantity and quality of commercial space is not unlike finding a 4 leaf clover: Tough on the best of days. We really thought we had found the right space for our project. We found a commercial space that is located exactly where want to be, with the perfect amount of space for our operations, a decent rate, with an amazing landlord, who would like us to be there for up to 20 years. It felt really good to find this space. We negotiated a lease for the better part of 4 months, and finally came to an agreement on terms about 4 months ago. Our agreement allowed us a 3 month period that we could apply for a DP, and carry out some due diligence on how this space would work for us. Our first hurdle was to apply for a Development Permit, which we have successfully done. Though we haven’t officially heard back from the City of Vancouver on the outcome, we don’t see any reason why we can’t move ahead. Our second hurdle was the floors. Oh yes, the floors. Essentially, the substrate of our floors was subsiding, which means that our floor is dropping and dropping. Like all problems, you can fix anything if you throw enough money at it. We had some contingency in our retrofit budget , so we figured that we could overcome the flooring problem with more money. About $30,000 to be exact. Well we just came across our third hurdle, and it is a little bigger of a nut than our second. We thought we were free and clear with the electrical in the building. We have 400 amps available, and we always thought it would be enough for our needs. In the past week it has become apparent we need at least 500 amps and preferably 600 amps. It would be simple to say why the hell didn’t you know that 400 amps was insufficient? The problem is until you make choices on your space, you don’t know what your exact load is going to be. Draws on power are HVAC, Refrigeration, Tasting Room, Offices, Kitchen, etc. The problem is that we made assumptions for this power based on a 6,000 sq ft space. Now that we are entertaining a space about 9,000 sq ft, you can basically multiply all your power needs by about 1.5. You can see how we ended up here. OK, so no problem for a power upgrade but just running more power to the building from the pole out back! Wrong. The power poles that supply our building already have 3 transformers on the pole, which means that this pole is maxed out. Crap. This leaves our option to get additional power either putting in a Pad Mounted Transformer for about $120,000 or putting one on the roof of the building for even more. What the F#$%! This absolutely blows. So now, after all the time and work (never mind money) we have put into this space, it looks like we are about to walk away. While we would like to make this space work, we just can’t afford an extra $120,000 bill. We might be out about $30,000 so far, but it is worth it to lose this money in order to not lose our shirts down the road. So we now have a huge decision to make! Option A is to drop another $120,000 and push ahead with this space, realizing our dream. Amortizing $120,000 over 20 years is only $6,000 per year, which in the grand scheme of things isn’t that much. Option B is to walk away and find a space without the number and cost of upgrades this space needs. We would go into this process knowing full well that it could be another 6 months before we find another space that works really well for us. We have another 2 weeks to make our decision, before the subject period on our lease expires. In other words, our landlord will want us to piss or get off the pot with regards to his space in 14 days. Looks like there will be a lot of sleepless nights coming up. If you have any advice for us, please contact me to pass it along. It would be greatly appreciated. Until next time ….. This entry was posted in Brewhouse and tagged BC craft beer, British Columbia, Business, Electrical, how to start a micro brewery, HVAC, Landlord, Lease, Money, Office, Space, Technology, Vancouver on December 1, 2013 by locuswest. I have received some feedback lately around wanting a general update on our progress. There seems to be genuine interest in how the overall project is going versus what we are encountering on a daily basis. As such, this post is a little more of a general update on our progress rather than a general rant about this process, or a specific detail of things. So as you likely know, we have submitted a development permit to the City of Vancouver for a space in East Vancouver. On Thursday of last week, we were told we’ll be given an answer on this permit in the next couple weeks. We are waiting for this permit, as we can’t lease the space we are interested in without first getting approval to brew there by the City. In Vancouver, the only buildings that you can outright lease and know with certainty you can brew is M2. The trick is that there isn’t a lot of M2 zones, and the buildings we were looking at in M2 just weren’t right for us. So we ended up in an I2 zone, which is one where brewing beer is conditional upon submitting a development permit. Any potential for us to use this space hinges on getting this permit, so we are waiting with fingers crossed to get good news. As of Nov 18th, no news! Another big process is collecting and securing money from investors. Luckily, an investment in our brewery is eligible for the eBC tax credit, which basically means that 30% of each investors money is returned to them in the form of a credit from the government of BC. It looks like we need to raise over $1,100,000 so everything we can do to help secure “financial partners” is welcomed with open arms. We are going to be collecting money in the next 2 weeks from our investors, so I hope that what people have committed is what they are going to offer us. If not, I am sure I will post something around my frustration with this. Financing is another part of the business that is really important. We will need both an operating loan and a line of credit in order to make the business float during the crucial first couple years. Opening a brewery can be a recipe for financial hardship, as the line between profit and loss on a monthly basis is razor thin. If sales fall behind a little bit, and costs are a little higher than expected, money can go out the window very quickly. Luckily for us we were approved for a loan and line of credit to make our finances come together. These will total about $450,000, and when added to the money we are raising we feel like we should be in a good position to make things work. The layout of our space and submission for building permits is something we have been working very hard towards. In fact, this has taken the majority of our time of late. With the arrival of our Development permit by the end of November <fingers crossed>, we would like to have our building permit submission ready to go. This means that we need to have the layout of the space virtually complete, have the work needed by engineers complete, have all the drawings and work from our architect complete, and to have all other inputs ready to go. It seems really easy when I sit here and type this, but the reality is that there are so many moving parts to this, that it is incredibly complicated and difficult to carry out. Finalizing the layout of our space has taken us over 8 weeks, as there are SO MANY variables to consider. For example: Needs now versus in the future when we grow, tasting room connection to brewing space, retail area, production flow and functionality, the location of existing services, proximity of different spaces that need to be connected, etc, etc. Equipment is something that we need to have ready to go, so that we can be sure it is ready in time for production. We have looked to China, Europe, Canada and the USA for our brewhouse and tanks. To be honest, I can see why this step can be either really easy, or one of the most difficult steps. No two quotes seem to be alike, and the unknown factors of quality, timeliness of delivery, and follow-up support make these intangibles even harder to gauge in terms of importance. A big hurdle to buying Canadian is the price. Companies like Newlands and Specific Mechanical are local and have a good reputation in the business, but their prices are among the highest. Moreover, it sounds as though some of the other start-up breweries have experienced some trouble with them. Then there are the systems from Europe, where the quality is top notch, and the price matches. Moving East to China, the land of cheap equipment, but one where the after sale service is poor, and other local breweries have experienced trouble with having to repair brand new equipment. All of these things make choosing one company to work with very difficult. At the end of the day, it is a balance between all these things, and hopefully one company stands out as the best. At this point, we have no idea which one it will be. Another huge part of this process is our name. For the time being we are letting this one go for a few weeks. While we don’t have an official name yet, the focus groups we ran were instrumental in getting us closer to making this choice. The only problem is that we are putting out other fires that are more important at this time. Things like financing, layout, legals, accounting, etc. We anticipate having our name by the end of the year, and that should give us 8 months to create a brand around this. I hope this is enough time and that we make decisions that are based on sound principles. The legal side of things is something we kind of let slip and caused us a lot of grief and unnecessary stress. In order to raise money and run a proper incorporated company you need to have: A shareholders agreement (aka a partnership agreement), a subscription agreement, a set of articles for your company, and a share ownership agreement. All of these documents are tedious to create, and require the hard work of a legal team. Reviewing and revising take a lot of time and mean that you are continually working on getting these documents ready so that you can raise money, and provide a framework to investors on how your company will operate. There are literally hundreds of other little things to do, some of which are major and some of which are minor pieces of major components. There seems to be nothing that isn’t important in some way to the overall picture of this brewery. To be honest, I would love to find the time to blog about all these things, but I just feel too much pressure to write about them, rather than working away at them. This entry was posted in Brewhouse, Business Side of Things, Financial, Marketing, The Journey and tagged BC craft beer, British Columbia, Building Permits, Business, City of Vancouver, craft beer to do list, East Vancouver, Entrepreneurs to do list, Im Starting A Craft Brewery, Line of credit, Starting A Craft Brewery, Vancouver on November 18, 2013 by locuswest.